One day after blowing an opportunity to control sole possession of the 2011 Southeastern Conference Championship, No. 4 Florida Gators baseball (41-15, 22-8 SEC) earned a share of the league title by toppling the Kentucky Wildcats (25-30, 8-22 SEC) 19-3 at McKethan Stadium in Gainesville, FL on Saturday afternoon. Alone atop the SEC standings on Friday, Florida allowed Kentucky to score early and often, eventually falling 14-1. No. 2 South Carolina and No. 3 Vanderbilt, both of which lost their series openers on Thursday, claimed victories Friday to reestablish a three-way tie for first-place in the conference. Both teams also won Saturday, giving the SEC a set of tri-champions for the 2011 regular season. The Gators’ victory Saturday marked just the second time in program history that Florida has won back-to-back conference titles (1981-82). The program now has 12 overall league titles and three-consecutive East Division championships. The Wildcats scored first Saturday, plating a run with three consecutive hits in the first inning. The Gators responded in the bottom of the second as their lead-off batter, sophomore designated hitter Brian Johnson, connected for a homer on a 1-2 count to tie the game. Florida jumped ahead for good in the third, rallying for a pair of runs to take a 3-1 lead. Senior second baseman Josh Adams scored sophomore catcher Mike Zunino via a ground out, and Johnson followed by knocking home junior right fielder Preston Tucker with a single up the middle. With freshman right-handed pitcher Karsten Whitson (7-0) holding Kentucky to its single run, the Gators exploded with seven scores in the bottom of the fourth. Men were on second and third with one out when Zunino singled to right to score the first run of the inning. Tucker followed with an RBI single to left, and Adams doubled down the left field line to score another baseman. Johnson’s (3-4, HR, 4 RBI, 2 R) two-RBI single to center brought Adams and Tucker home, and a two-run homer by sophomore first baseman Austin Maddox cleared the bases for Florida, which ended up leaving two on base before Kentucky could get out of the inning. The Gators kept the pressure on in the fifth as Zunino opened the inning with a double to left; he scored two batters later when Adams singled to left. A wild pitch advanced Adams to second and Tucker to third, respectively, sending Maddox up to the plate to connect on a three-run homer, his second deep shot of the afternoon. Whitson (5.0 IP, ER, 7 H, 4 K) was pulled for junior RHP Tommy Toledo to start the sixth. Florida ensured his victory would be realized by adding another pair of runs in the bottom of the inning. Zunino (4-4, RBI, 4 R, BB) singled with two outs to get on base, Tucker (5-6, 2 RBI, 5 R) doubled him home, and Adams (3-6, 4 RBI, 2 R) made sure Tucker crossed the plate with a single to center during his at bat. 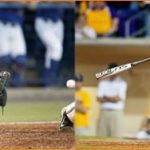 The Gators added three more in the eighth; Maddox’s (3-6, 2 HR, 6 RBI, 2 R) ground out RBI scored freshman pinch runner Keenan Kish, junior pinch hitter Tyler Thompson’s two-out single to left scored Tucker, and redshirt sophomore pinch hitter Vickash Ramjit’s subsequent single scored junior pinch hitter Ben McMahan. Florida, which allowed Kentucky to score two runs of errors in the top of the ninth before ending the game, also earned the No. 3 seed in the 2011 SEC Tournament with their victory. The Gators combined for 25 hits on the afternoon, their most against any opponent this season. Florida will face No. 6-seed Mississippi State in the first round of the tournament on Wednesday in the second match-up at their site.